· 16% of the S&P BSE 500 Companies had women company secretaries. A number that increased by 4% compared to the earlier year. · 10% of the Secretarial Audit Reports were signed by women company secretaries, an increase of 1% over the previous year. We wanted to put these numbers into perspective, as anecdotal evidence of company secretaries seen in conferences, training sessions and applications received for job vacancies suggest that women company secretaries outnumber if not are equal to the number of men. A possible reason for this under representation in S&P BSE 500 companies sample size could be that the women company secretaries were junior having qualified in recent years compared to their male counterparts. The next logical step was to analyse the compensation paid, and see if there was any variance in the compensation paid between the two and if yes, what could be the reason for such variance. The average compensation of women Company Secretaries was Rs.31.61 lakhs, which is 52% of Rs.61.34 lakhs for men Company Secretaries. However glaring, these are stark facts that cannot be disputed. Analysing further the reasons for variance in compensation, we came across two critical factors that contributed to the dispersion. The first was the size of the company and the second was multiple roles clubbed with the company secretary role. It goes without saying that larger the company higher the compensation and likewise wider the role higher the compensation. Analysed by their turnover, we notice that the presence of women was lower in bigger companies. For instance, among the top 100 companies only 6 had women Company Secretaries. Further, the top 50 had 3 and in the top 25 companies only one was a woman and that company was 24th in the ranking. Among Company Secretaries holding multiple roles, only 30% of women company secretaries held multiple roles in contrast to 48% among male company secretaries. Further while 11 companies combined the role of CFO&CS,all these eleven were held by men. These factors taken together is reflected at the two ends of the range, where the highest paid Company Secretary in our study sample was a male holding multiple roles (Jt MD, Company Secretary & CFO) drawing Rs.902.32 lakhs. In contrast the lowest paid Company Secretary was a female, holding the sole charge as Company Secretary drawing Rs.3.00 lakhs per year. Of the two−size of company and multiple roles, we believe multiple roles has a higher weightage in influencing the compensation. 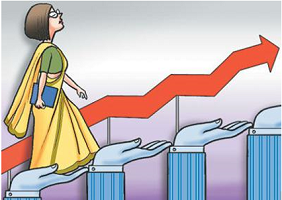 Hence women company secretaries desirous of bridging the gap should look at acquiring multiple qualifications like Law degrees and CA or ICMA certifications. Wish you all a very happy Women’s day. Hope to soon see the day when this gap is fully bridged, for a fair society is good not just for women but for men as well.